There are different types of houses where we live in. It protects us from many things like sun, rain, wind and enemies. Houses are of two types: (i) pucca house and (ii) kutcha house. Pucca houses are strong houses. They are made up of wood, bricks, cement, iron rods and steel. 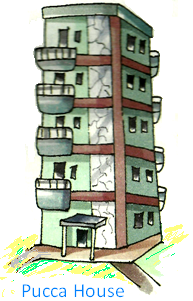 Flats and bungalows are pucca houses. Such houses are called permanent houses. Kutcha houses are made up of wood, mud, straw and dry leaves. A hut is a kutcha house. Some people live at one place for a very short time. They build houses that can be moved from one place to another. Such houses are called temporary houses. Caravan, tent and houseboats are examples of temporary houses. Gypsies live in houses on wheels called caravans. 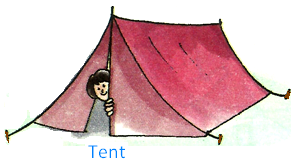 A house made of cloth is a tent. 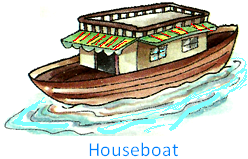 A houseboat is a floating house. Many soldiers live in tents in their camp. 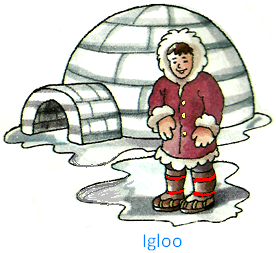 A house made of snow or blocks of ice is called an igloo. Eskimos make it. They live in very cold places. What are the things needed to build a house? Most of us live in houses made out of bricks, cement and steel. Wood and glass are used to make doors and windows. Many people use other things to make their houses, such as straw, wood, mud and stones. Houses on hills have sloping roofs. People living in areas where it rains a lot make houses on stilts with sloping roofs. People living in plains usually make houses with flat roofs. How can we define a good house? A good house should have plenty of fresh air and sunshine. A good house should have trees nearby. A good house should be neat and clean.